Once you buy a toy, no one can tell you how you have to play with it. Which is why this is the last time this review will mention Supernatural's demon king, Crowley. TNT's Leverage followed a team of con artists who used their shady skills to take money from corrupt assholes who were cheating or abusing normal people. It was great. And while they did have a few recurring enemies, no one showed up with as much regularity as James Sterling. Originally an insurance investigator, Sterling just kept coming back again and again - and the rule in the writers' room was "Sterling never loses." He constantly got the better of the team, even when they managed to pull off their con. He's the kind of guy who could start they day locked in the trunk of a car and end the day being recruited by Interpol. His success kind of makes sense, because while he is an antagonist, he's not a villain. He's a good guy. He doesn't go after the team for personal reasons, he doesn't try to frame them for things they didn't do, he doesn't do anything a villain villain would do: they're criminals, he's law enforcement, getting in their way is his job, and he happens to be very good at it. Sterling is played by character actor Mark Sheppard, who you may also recognize as Badger from Firefly. It's certainly how I recognized him when he first showed up on Leverage - "hey, it's Badger!" Except now when he's on anything, it's "hey, it's Sterling!" Also, it really speaks to how good the design of this Mystery Mini is that, despite having no idea who has or hasn't been on Supernatural, I could still instantly tell what actor this was supposed to represent. How does a toy with no facial features still manage to look smug? Sterling is wearing an all-black suit with a lighter blue tie. There are thin grey lines painted on the knees and elbows, to represent wrinkles, while his coat has sculpted lapels and buttons. His left hand is tucked in his pocket, while his right is holding a silver blade of some sort. If this were a Supernatural mini, it'd probably be an angel blade. But this isn't, so it's not. The only notable stabby thing in Leverage is the Dagger of Aqu'abi from Season 3's "The Rashomon Job," but I don't remember Sterling being in that episode; do you? Of course, the dagger did end up the property of his insurance company for a while, so maybe he had access to it in that context. Some people would say that I'm delusional to claim this is a toy of Jim Sterling (not that one), but they'd be wrong. I paid my money, and if I say it's a good character from a good show, it doesn't matter if the manufacturer says otherwise. After all, how could it? Sterling never loses. 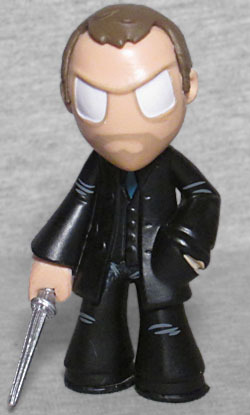 This entry was posted in blog exclusive review, Funko, videos and tagged Mystery Minis. Bookmark the permalink. Supernatural is a chick show. And you're not a chick. Hey, it's the lawyer from NuBSG aka GINO.